These images were sent to me by Kenneth James Haase. 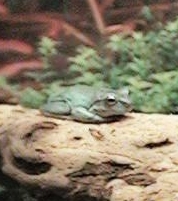 They are photos of his pal, Kermit the White's Tree Frog. Kermit has his own Homepage where you can go look at many more fun photos of this little guy! 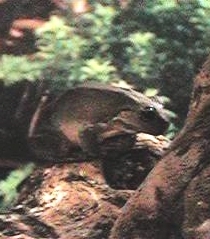 Info about these frogs can be found on the Whites Tree Frog page. Click on the thumbnails to see them full sized. These images were sent to me by Lisa Dorfman. 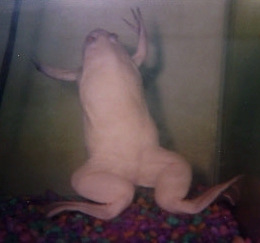 They are photos of her 4 year old Albino African Clawed Frog, Otis. 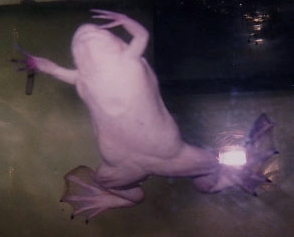 Info about these frogs can be found on the African Clawed Frog page. Click on them to see them full sized.